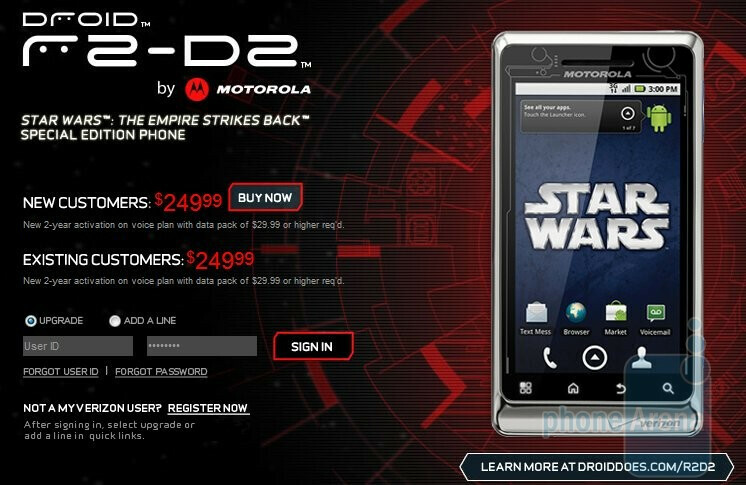 Verizon surely had a blast last night when many locations across the country held special launch parties for the Motorola DROID R2-D2 Special Edition. Not only did they give away some cool prizes at the events, but some people were even dressed up as various Star Wars characters from the movies. If you weren't able to attend any of the festivities held last night and missed out on checking the handset, you'll be happy to know that the big day is here as the R2-D2 Special Edition is now available for purchase through Verizon's web site. Naturally, you'll have to shell out $249.99 with your signature on a 2-year agreement, but we'd imagine that the price would be more than fitting since it comes packed with goodies to make any fan content. Does anyone know how long this phone will be available??? it's available until it sells out... limited edition. theres about 40,000 left.